I am in many ways exasperated with the state of our national government with all the picky nonsense, the garrulous quarreling. LEAD already! But there is no set of institutions better at creating databases than ours, and lately these civil servants have been digitizing the records and making the database searchable from your home! The Department of the Interior’s Bureau of Land Management–General Land Office website receives this week’s TOP HITS award! I have the honor of being custodian and researcher for a batch of family documents, many of them related to land transactions in the 1840s-1860s. Armed with the family surname, Minor, and the county and state mentioned in the document–Moultrie, Illinois in this week’s search–I was able to draw up all of the land warrantees and patentees for the Federal distribution of public lands. What an experience to confirm with government documents that my ancestors participated in the westward expansion of our country. 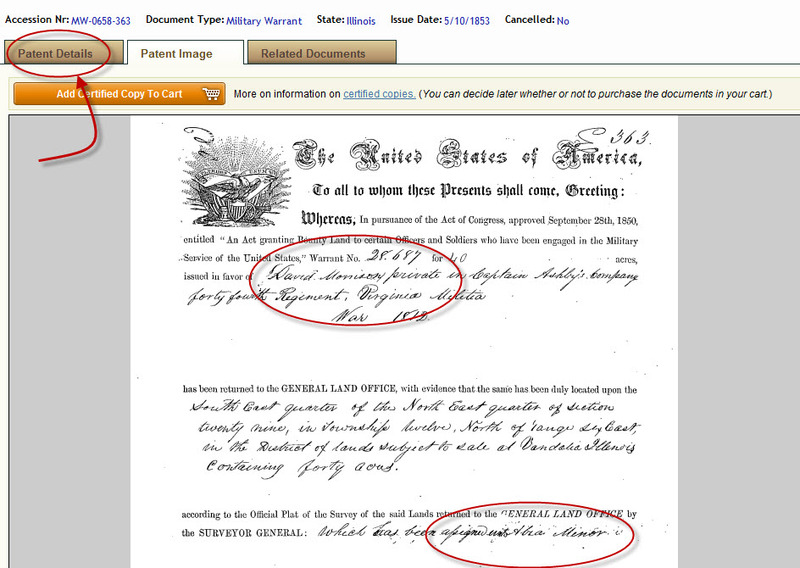 In this case, Abia Minor, son of John Pearson Minor, is assigned the land originally warranted to War of 1812 veterans. By clicking on the far left hand paper icon I can access the original document. I can even order a certified copy of this document without leaving the page. Clicking the details tab on that page gives a second page that succinctly states the specifics of the land now to be in Abia Minor’s name. As I reread my satchel stash of transactions between father and son, this newfound government information will enrich my understanding of family dynamics and of government policy impact on those interactions. Great job of leading already yourself, Kay! The most influential thing folks can do is find something positive and work FOR it. Thank you!